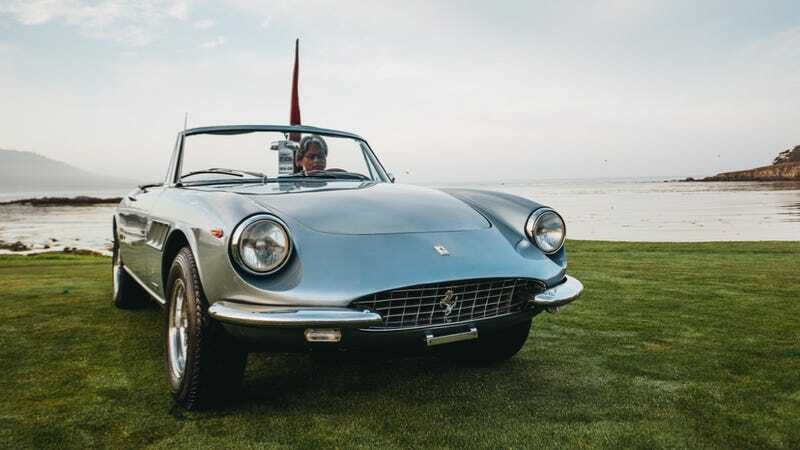 You want every picture we’ve got from the Pebble Beach Concours d’Elegance? You want every curve, every detail, every achingly gorgeous car from every perfect era? Fine. Have it your way. Here are 90 (ninety!) photos of absolute motoring magnificence, captured by photographer extraordinaire PUPPYKNUCKLES. Starting with this Ferrari. It’s nearly impossible to convey the opulence of Pebble into mere words, but I’ll give it a shot. Over $390,000,000 worth of cars was auctioned off as part of the festivities, averaging half a million dollars each. At the Concours d’Elegance itself, the crushing (and crushingly wealthy) crowd presses against one other, simultaneously fighting to get as close as possible to the displays of vehicular art without actually touching them. Over here is an elegant blonde lady in a lavish hat. Over there is a man in a short-sleeved button-down Corvette shirt, with matching Corvette pants. Arnold Schwarzenegger mills about, popping up in the McLaren “tent,” which is really just a glass-and-steel building erected for the event where they served some really awesome food and cocktails. But none of it matters, because you’re surrounded by a visual, vehicular display of bel canto, and everything is wonderful. Anyways, what I’m saying is, we need to re-examine our approach to the estate tax and capital gains taxes.